It turns out all browsers that support HTTP/2 also require TLS (HTTPS). So my first step was adding HTTPS support to agilitycourses.com which also provides a backbone on which I'll implement secure user profiles. Then I wanted to enable HTTP/2 to see if it improved the speed of pages served to end users. After a little research I found that recent releases of NGINX support HTTP/2 and those versions are packaged with Ubuntu 16.04 LTS. That made upgrading to this latest long term support OS version a better approach than just upgrading NGINX on my older OS. I basically went through the standard upgrade process. While I had to work through a number of small issues upgrading my older websites; the biggest change was converting my upstart scripts to systemd scripts. But the beauty of hosting with virtual servers is it was trivial to create an image of my existing server, spin up a temporary server using that image, and then practice the ugprade/migration on the temporary server. I was able to move some configuration changes back to my live server and test out the changes to my sites' Fabric deployment scripts. Once everything was working I configured my websites that contain user modifiable data into maintenance mode on my temporary server. Then I pointed the DNS for all my domains to the temporary server. After DNS propagated I shutdown Postgres and the webserver on my original server and created a backup image. Then I went through the upgrade process. Once I validated the migration was successful I switched the DNS back to my original server and shutdown the temporary server. After a couple days I deleted the temporary server and the pre-migration backup image. Then I just reloaded the Nginx configuration: sudo systemctl reload nginx. That was it! The obvious difference is in the Timeline - Start Time column. In the first diagram you can see the "waterfall" queueing up of requests for images as all the open sockets to the domain were in use. In the second diagram you can see them all interleaved as they are multiplexed across the same connection. 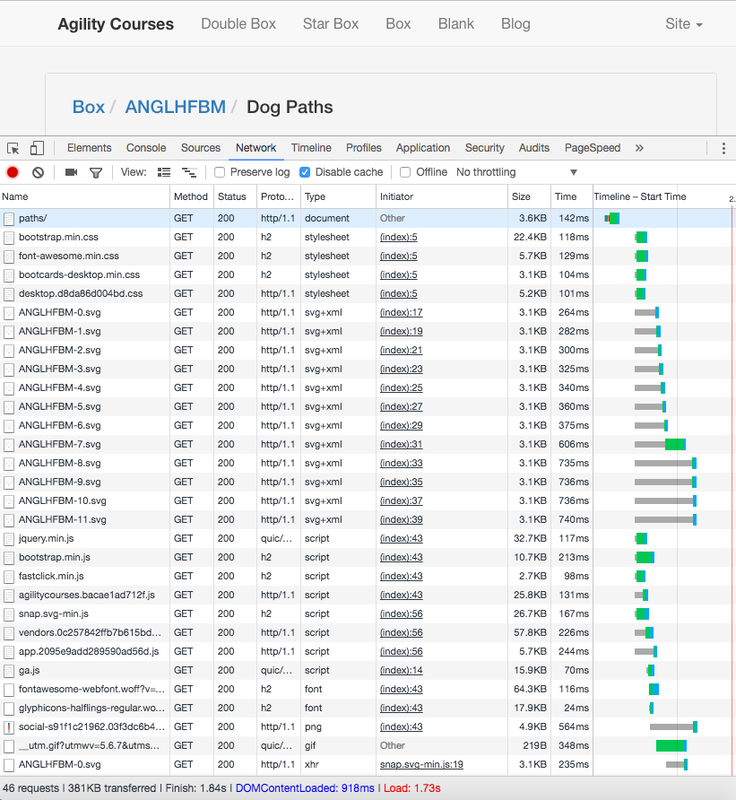 Also the bottom line is the page is fully loaded in 1.73 sec using HTTP/1.1 and in 1.16 sec using HTTP/2 for a 33% end user page load improvement! Bring 3rd party resources back to my domain to save DNS lookups and see how that affects overall performance. 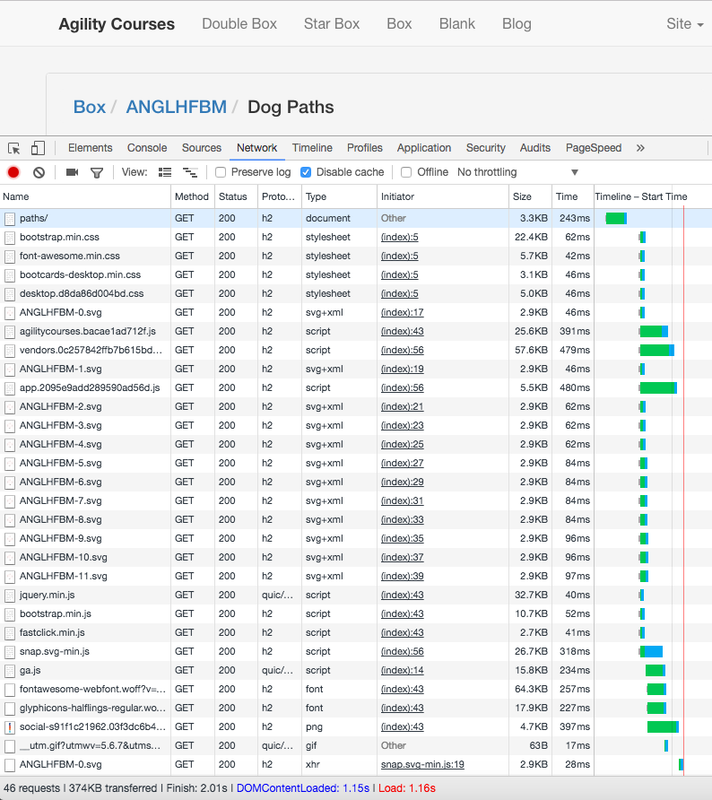 This may hurt performance for HTTP/1.1 clients who are limited to the number of connections per domain. Change multiple SVG files (which are all steps in a progression) into a single file and use CSS to hide/show appropriate steps using a single image. This will greatly reduce the number of individual files downloaded and save some duplicated data within those files. Move Google Analytics locally. GA has a number of problems (short cache times and multiple files downloaded) so at the cost of periodically updating the files I could host them all locally and save some time. Disqus is even worse than GA when it comes to many file downloads, redirects, short cache times etc. I might change to have Disqus data loaded on user demand. preconnect might help reduce the cost of DNS look ups that result from redirects like those used by Google Analytics, Google Fonts, and Disqus resources. preload to load resources before they are accessed by JS during onload or via user actions. prefetch to load JS/images for future pages. There are some common workflows on this site that could benefit from prefetching the JS for subsequent pages.